The Georgia World Congress Center continues to be one of the nation's premier destinations for conventions, trade shows, film production, and much more. In 1971, the Georgia General Assembly passed legislation establishing the Georgia World Congress Center Board, later renamed the Georgia World Congress Center Authority, to develop an international trade and exhibition center in Atlanta. Five years later, the Georgia World Congress Center (GWCC) officially opened its first exhibition hall to host the Bobbin Show/American Apparel Manufacturers Association. Four decades later, the GWCC is now a 3.9 million-square-foot facility, the fourth largest convention center in the country. The center features 1.5 million-square-feet of exhibit space, 12 exhibit halls, 98 meeting rooms, two ballrooms and three beautifully landscaped outdoor plazas. The Georgia World Congress Center (GWCC) opened its doors in 1976 as a 350,000-square-foot exhibit space. 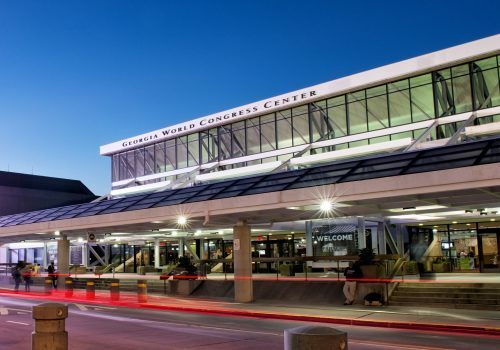 Since opening, the GWCC has gone through major expansions in 1985, 1992, and 2002 to meet the needs of growing conventions and special events. The Georgia World Congress Center officially celebrates the completion of the Phase II expansion project on April 26, which adds 1.1 million square feet. The GWCC Phase III expansion is completed increasing the facility’s exhibit space to 950,000 square feet in eight exhibit halls. During the same year, the Georgia Dome, the first multi-purpose stadium of its kind, opens its doors and hosts its first Atlanta Falcons home game. Grand opening ceremonies for the completion of the 1.1 million square foot Phase IV expansion makes the Georgia World Congress Center one of the largest convention centers in the United States with the addition of 420,000 square feet of prime exhibit space.